five-day residency with the ¡Viva el Arte de Santa Bárbara! program. The residency is just the latest from the folks behind ¡Viva el Arte de Santa Bárbara!, a community-minded collaborative effort from UCSB’s Arts & Lectures, the Marjorie Luke Theatre, Isla Vista Youth Projects, County Education’s Children’s Creative Project, and the Guadalupe Cultural Arts and Education Center, among others. Serving some 15,000 people throughout the county each year since it began a decade ago, Viva el Arte works to provide a wide range of music and dance programming free of charge for school children and their families. “Each year, we make a real effort to bring living traditions to town — most of them Latin American in origin — and maybe introduce the kids and their parents to something they have never seen before,” said Cathy Oliverson, director for educational outreach and manager for performing arts at Arts & Lectures. 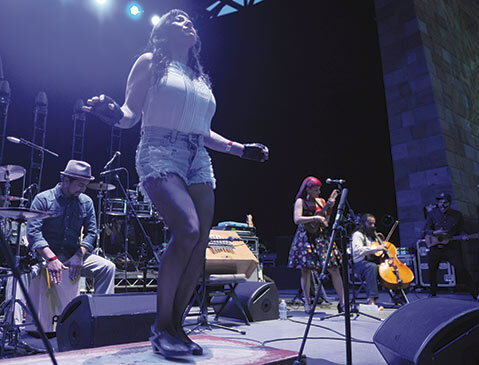 The 2014-15 edition of Viva el Arte, which concludes with the upcoming Las Cafeteras visit, has already featured Mariachi Garibaldi de Jaime Cuéllar, the Contra-Tiempo Urban Latin Dance Theater (whose residence included a flash mob dance at the Santa Maria Town Center Mall), Mariachi Flor de Toloache, and M.A.K.U. Soundsystem. “It’s been a great year, but we are definitely going to end it on a high note with Las Cafeteras,” said Oliverson excitedly. To be clear, the offerings provided by Viva el Arte are about a whole lot more than just free concerts and dance performances. Public schools, thanks to years’ worth of budgetary bloodletting, don’t deliver anywhere near the same level of music and dance that they once did, and family budget realities often prevent moms and dads from being able to expose their kids to the living culture so often happening on stages throughout the South Coast. For a full schedule of ¡Viva el Arte de Santa Bárbara!’s Las Cafeteras concerts and education workshops, go to facebook.com/VivaelArteSB or artsandlectures.sa.ucsb.edu/Community/VivaElArte.aspx.